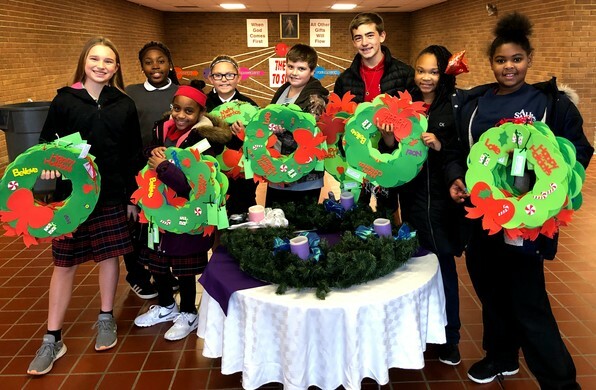 All Saints Academy students from all three campuses (St. Ferdinand, St. Norbert and St. Rose Philippine Duchesne) made colorful Christmas wreaths and distributed them to neighboring senior living centers to spread some Advent joy. Sacred Heart's first grade students led the school in song and prayer to begin the 2nd week of Advent. 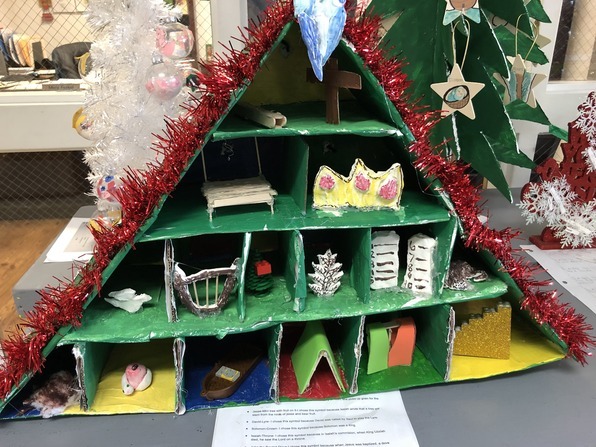 Christ Light of the Nations students and families created beautiful Jesse Trees, Nativity scents, and Advent wreath projects. Click here to view more photos. This Advent season there is a Shepherd on a Search at Holy Spirit school! Every day he leaves the students a clue where to find him. For the 4th year, students in 3rd and 6th grades from all of our schools are participating in the CatholicFIT program. 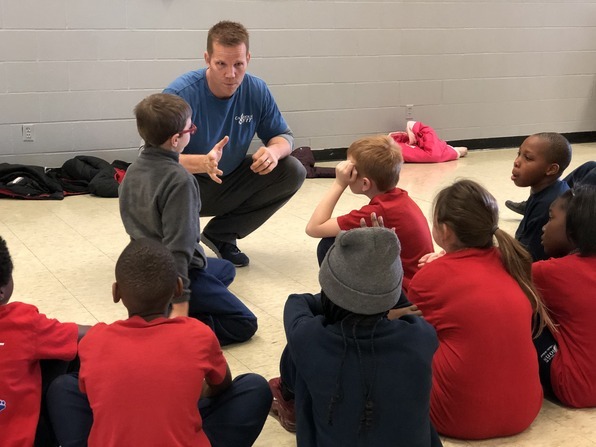 The 8-week program provides curriculum content for PE Class, exercise demonstration videos and a visit from Professional Fitness Trainer and CatholicFIT Creator, Dave Reddy. In the photo above, Mr. Reddy is leading the 3rd Grade PE Class at Christ Light of the Nations School. Each week, PE teachers share a new "Exercise of the Week" along with CatholicFIT principles that help them remember that they are each a beloved child of God and make the connection between their faith and fitness. Click here for an example of the weekly handout that is sent home with each student, to encourage them to continue the conversation and exercises at home. This fall, CatholicFIT is in progress at All Saints Academy St. Ferdinand and St. Rose campuses, St. Ann and Christ Light of the Nations. The remaining schools will begin in February. 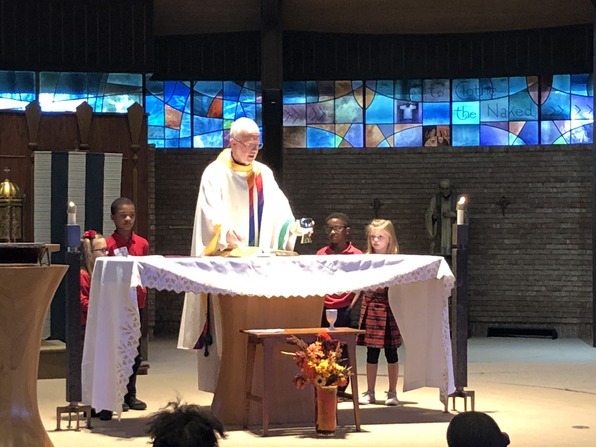 In October, three separate retreat days took place, with 3-4 classes of 2nd grade students from various schools (3-4 schools represented on each of the three dates) gathering at Pallottine Renewal Center for a day of reflection on the sacraments of Reconciliation and Eucharist. Each day began with music and games, followed by a talk on the Forgiving Father (story of the Prodigal Son) and introduction to the Heart Room Prayer. Each student did a craft activity decorating a heart with the prayer printed on the back. Later in the morning, they heard the story of the feeding of 5,000, followed by lunch, another craft activity making Virtue Chalices, and ending the day with Mass. Teachers reported that their students were still talking about fun memories from the day in the days and weeks that followed. Part of the funding for these retreats was provided by a grant from the Koch Foundation, a Catholic foundation whose mission to strengthen and propagate the Roman Catholic faith by providing grant support for a wide variety of evangelization efforts. Congratulations to the Trinity ACA Essay Contest Award Winners! All recipients received a letter from Archbishop Carlson - read the letter to our students here! Please join us in congratulating our excellent student writers and share the good news with your community! TRINITY TITANS WIN STATE FOOTBALL CHAMPIONSHIP! The Trinity Titans are state champions, having beaten Cardinal Ritter College Prep 45-19 at Faurot Field in Columbia, Mo on Dec. 1! This was a historic first time meeting of two St. Louis Archdiocesan schools at the state tournament. 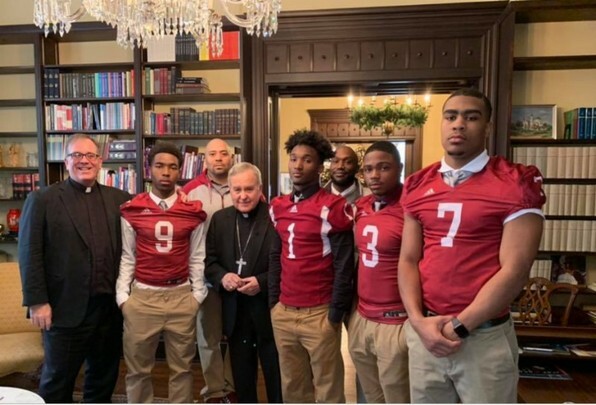 The football captains met with Archbishop Robert Carlson on November 30 and the captains of Cardinal Ritter College Prep to do a ceremonial coin toss! Ritter called heads and it came up tails. We are grateful to Archbishop for his blessing! Trinity Receives Grant Award from Raskob Foundation! This is an exciting project that will give concrete skills to our faculty and develop youth leadership in the areas of brain health, resilience and community formation! 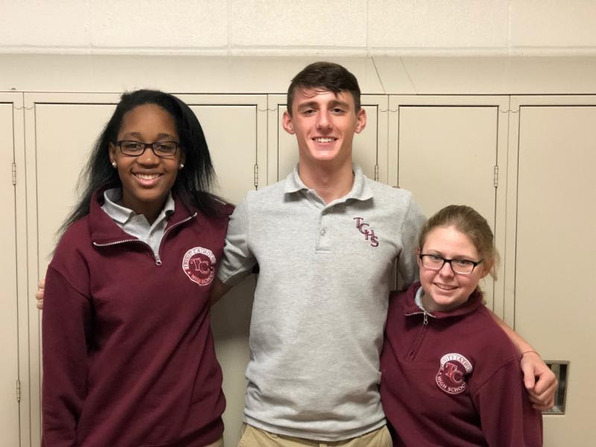 Read more recent news from Trinity Catholic High School in their December 2018 Online Newsletter. 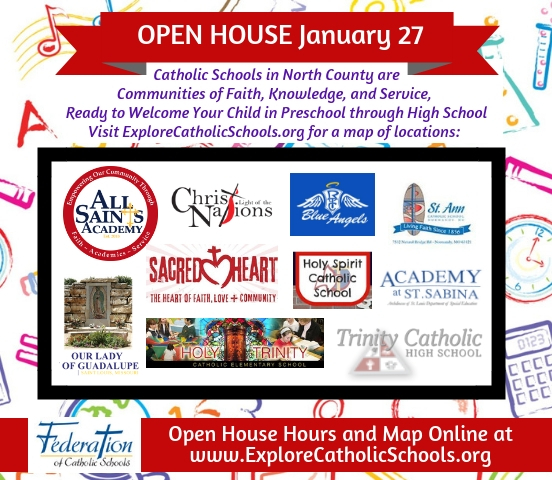 Catholic Schools Week Kicks off on January 27, 2019 with Open Houses at each elementary school location. 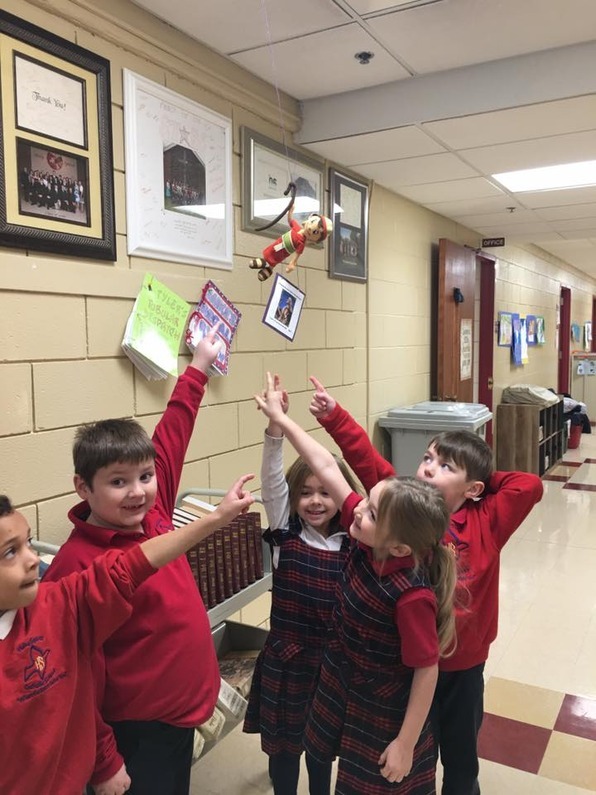 It's never to early to share the benefits of Catholic Schools with your friends.